When I considered moving to Wyoming, I found that I would have taken a significant cut by doing so. I work in Fargo and I think we have the highest nursing wages in North Dakota. Benefits pretty good, too. Who am I, the HIPPA police? A lab tech at our facitility was fired for a similar situation. HIPPA does not give you any leaway, so you were right to be concerned and that nurse had no business pulling what she did. I would have written her up (I am also a nurse) so rank does not count. I am from that midwest state of North Dakota. And no, it didn't work. We too have a nursing shortage, though not as bad as some states. The BSN requirement was dropped after about a 16-17 year requirement. It did not help in any respect. The pay was not better, jobs did not differentiate whether you were a 2, 3, or 4 yr RN. All it did was frustrate the nurses. 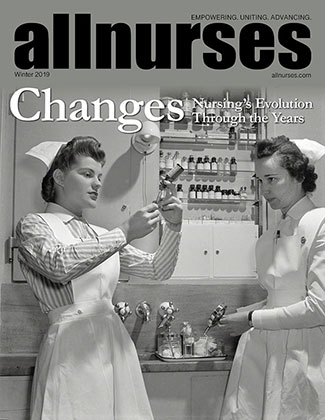 Those here in school were required to be in the BSN program, but nurses from other states and Canada were able to work here without being a BSN, needing only to be "working" on it, which meant they could take 1 course a semester and take however long they wanted, usually not staying very long. Only someone sitting in an office somewhere could think this works better.